Nudge Bars Perth – Keep the front of your car dent free! Whether you regularly drive in roo-ridden areas, or simply want to protect your car from the poor driving skills of others, you need a nudge bar for frontal protection. Midland Towbars can help protect your car from a variety of mishaps by installing one of our airbag-compatible nudge bars. And the great news is our models look good too. Not only will a nudge bar keep damage at bay, some models are ideal for mounting other accessories, such as auxiliary lighting or antennas. Whatever your vehicle, whatever your needs, we’ve got the answer. We supply and fit the ECB brand of Alloy Nudge Bars and the Artav range of Stainless Steel Nudge Bars. Impact protection is just one of the benefits of an eye-catching 76mm ECB Nudge Bar. Designed and manufactured in Australia to protect your vehicle against the harsh Australian environment, ECB’s 76mm Nudge Bar is formed from high tensile alloy tubing and will never corrode or rust. ECB Nudge Bar are designed to suit each individual model; therefore you can be assured of an aesthetically pleasing, functional and reliable design. ECB’s 76mm Nudge Bars come complete with spotlight mounting tabs and a specifically designed steel mounting system. To complete a great looking performance product, choose from ECB’s range of superior, low maintenance powdercoated finishes, or the ever-popular mirror polished alloy finish. 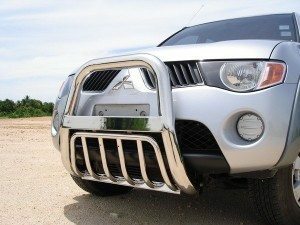 Owned and run by the same team that introduced the first Stainless Steel Bull Bars to South Africa over 15 years ago, ARTAV have an experienced, passionate team who are continually developing attractive, innovative products for the 4X4 and SUV market. Now in Australia, ARTAV’s range of Stainless Steel Nudge Bars are “putting your protection up front”! Now a bolder, more aggressive profile, the introduction of ARTAV’s 4-inch oval range has had a profound impact on styling and performance. Contact us today or come on down and check out the new ARTAV range of Stainless Steel Nudge Bars. Defend your vehicle with a nice looking nudge bar and then dress it up with a pair of Spotlights or an LED Light Bar. Midland Towbars: your One-Stop Accessory Shop! Midland Towbars specialise in Nudge Bars Perth WA.